Travelers between Shirlington and the Pentagon have more than 160 buses in each direction per day that they can ride. However, the design of the bus bays and the lack of combined schedules creates inconvenience for passengers, requiring them to choose between bus bays that are far apart and knowing multiple schedules, among other issues that could be rationalized. There are several routes between Shirlington and the Pentagon: Metrobus routes 7A, C, E, F, Y; 22A; 25A, D; and ART87. The 7 and 25 buses are express, traveling directly between these two stations in 6-9 minutes depending on traffic. The 22A makes a few stops before getting on I-395, resulting in a travel time of about 12-14 minutes. The ART bus takes a local route that takes about 23-27 minutes. (In almost all cases, those traveling between these two endpoints will get there sooner by waiting for the next, quicker Metrobus than taking the ART.) There is also an ART 87X, which is express to the Pentagon during rush hours. At Shirlington, the bus bays that serve these passengers are not ideally located. At Shirlington the 7 and 25 buses are located at Bus Bay C while the 22A is located at the farthest possible point away, bus bay A. Compounding the problem is that the 87X stops at bus bay E.
Because these buses are traveling in opposite direction, it's not possible to locate them all at the same bay, but they could be placed in adjoining bays A & E or B & C. That way a passenger wanting to go directly to the Pentagon will not have to dash around the station to the far end to catch the other bus. The situation at the Pentagon may be about the best they can do, with the 4 adjoining bays, Upper 3, 4, 5, and 6 serving these routes. Riders have to be astute to note the alternate buses arriving and knowledgeable of their various options. ART bus locations are not shown on this map, which appears to be somewhat out of date. Additionally, because there are several routes that serve these two points, many riders probably only learn over time that they have several options. There is no combined point-to-point schedule of the 160+ buses per day that would make this information easy for passengers to have, hold and use (see previous post on this topic here). Also, since NextBus treats each bus bay as a separate stop, it doesn't effectively serve these customers, who don't care what bus number they get on--they just want to get between these two points as quickly and easily as possible. 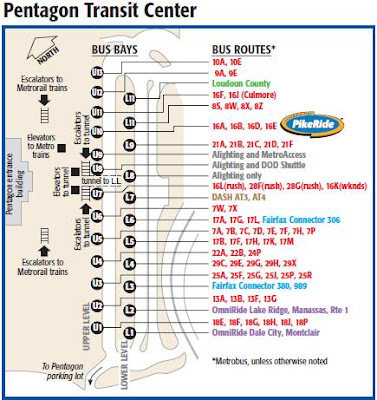 However, there are other cases in which changing the locations of bus bays at the Pentagon might help customers with options. For instance, the 29 and 17 buses both serve some of the same parts of Annandale, but are located on separate levels at the Pentagon. Similarly, the 25 and 8 buses share parts of Alexandria, but are located far apart at the Pentagon. 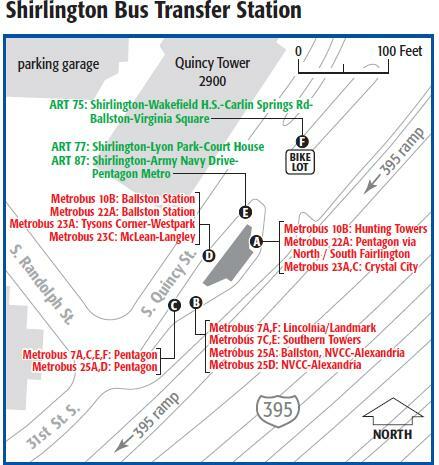 Some bright person could probably create a simple smartphone app using NextBus data that would combine the Shirlington and Pentagon bus stops (or other highly-used point-to-point locations), which would be quite useful. As mentioned above, there are more than 160 buses per day in each direction between Shirlington and the Pentagon, with the majority of these during rush hours. For instance, there are 16 inbound between 7:00 and 8:00 AM and 19 between 8:00 and 9:00 (although a few of these take longer than waiting for the following one). Even in the middle of the day, there is no 60-minute period with fewer than 6 buses--an average of one every 10 minutes or less. However, there are some gaps in service such that in a few instances combined waiting and riding time can take more than 30 minutes to travel this 4-mile distance. Aligning the schedules somewhat could make travel from between these points equivalent to taking Metrorail--just go to the station and wait for the next one. No schedule required. These simple changes and enhancements are the sorts of things that cost little or nothing, but that help make the experience better for passengers. It's important for transit agencies to put themselves in the shoes of the passenger at all times in order to see these opportunities and provide them to the riding public. Seems like the most sensible thing would be to treat Shirlington like a metro station. Have a single point to point bus line running directly to the Pentagon on 5 to 15 minute intervals dependent upon the time of day.